Neon. It's glitz and glamour from another age, a piece of dazzling technology worked into bespoke cultural artifacts. Here's your own tribute to this aging electric artform. It was June 5th the day I saw this neon sign for the first time, four days before I got kicked off my "home" by my sister's husband (I used to live with them since 2010, and we had I big fight cause of my brother-in-law's alcoholism). Fortunately a recent friend of mine received me at his apartment, with no problem at all, he is Spanish and came to Chile searching for a Job last September, so he knows what it feels like to be "far" from home. Anyway that day I was feeling sad, and very tired, with no money at all (now I'm on the startups business and quitted my job), I received a call of my friend, telling me he was late for home. I didn't had the keys, and I was already on my way to his apartment, hungry and very cold (is winter here), once again, with no money at all, so I started to walk alone around the neighborhood, thinking how much worse could go my life. Missing every single thing I had last year at this same date of the year: I was happy living my trip to Paris, France with a lot of funny moments, enough money to do several things and meeting awesome and unforgettable people. Then it happened, I saw this sign. I stopped walking, then I smiled, and a little drop of tear ran by my face. My favorite movie EVER (Back to the Future), with the specific message that would make me re-think everything, was there. 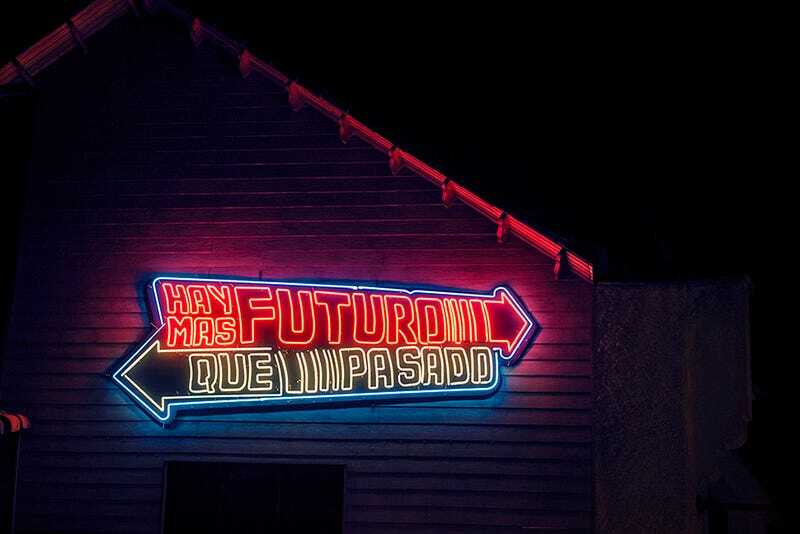 Just for someone's fun (this is not a restaurant or something, is just there in a house) Translation of the Neon Sign: "THERE'S MORE FUTURE THAN PAST" I was alone, with nobody to share my joy. Then few hours later, I was at my new "home" with my friend, and by coincidence I started reading feeds on Reeder, and this contest happened. Quite a coincidence, right? This shot was taken at the Neon Boneyard in Downtown Las Vegas. I used a canon T2i with a kit lens. It was taken in Raw and touched up in Lightroom. There are so many neon signs in Las Vegas but I pass this one everyday and always wanted a picture of it and this contest got me out there. This revolving sign belongs to a hamburger joint near where I live. I thought it might be fun to experiment with long exposures. The revolving portion of the sign reads "Duffy's" and is colored red on one side and blue on the other. Once I was satisfied with the exposure, it took me several tries to time the shutter's release to the point in the sign's revolution that produced the most desirable color pattern. I finally settled on a 10 second exposure, f/36, and an ISO of 200. It was shot on a Canon 60D. Another Second Saturday surrendered to the Wynwood Art District of Miami. In this up and coming Art Hub which has not yet fully defined its persona, multitudes of people flock every second Saturday of the month to check out the latest exhibits in a very unlikely part of town. Overtown—a place which is undergoing gentrification and is now dubbed Wynwood. Bordering soup shelters and homeless in cardboard boxes, art, artists, hipsters, and posers congregate to gawk and scoff at all sorts of art from street performers to bonafide sculptors, painters, and a photographer or two; not unlike yours truly. In this scene, you can take in a typical street-side view of Panther Coffee, one of the better known chill-out spots with its ubiquitous logo done-up in Neon. While the assignment called for a sign, I felt that the most accurate way to portray it is with the crowd that it draws beneath it. The image was taken hand held in aperture priority at 1/50 sec f/1.8 ISO 1250 on a 50mm (75 equiv) Nikon D5000. It was processed in Lightroom 4. I used a nikon D7100 with the Zeiss 135mm F2.0 lens. I actually put the camera in P mode and let it pick the settings except that I had set the aperture at 2.0. I drove around my small town last night, really not sure if I would find a lot of neon signs or not since most times I think that they are really "background" noise to what I normally see. But, since I wanted to enter this challenge, I took the time to look for signs and surprisingly found several interesting signs besides the ones that merely said"open". I figured that would be too common place. So I found two I liked a lot, one which was a salon sign with nothing but the neon in a dark window, but I chose the below sign since it was interesting to have both the neon in the window and then the backdrop of the Chinese menu on the wall in an out of focus fashion behind the neon. As soon as the contest was announced I knew I had to take a picture of Portland's iconic neon sign. To the great timing of the contest Portland had an iconic event happening that went right in front of the sign, being the World Naked Bike Ride. The bike ride went on for over an hour and a half, which gave me more than enough time to try a lot of camera settings. I didn't want to have crisp pictures of the riders (didn't want to feel like the creep taking pictures of the naked people, though that was unavoidable). And this is what I got to commemorate "Icons of Portland". Canon T4i, 55mm, ISO 200, 1/8 s.
I shot this entry in Austin, TX. I was shooting with a friend and noticed that many of the signs in south Austin have beautiful reflections on the big back windows of the SUVs that are often parked just outside of the businesses. Looking into the windows gives one the feeling of peering into an alternate world with only neon signs. I shot it with a 60D Canon DSLR and a 18-55 f/3.5-5.6 lens. It's at ISO 800, 1/25, f/3.5. Camera Info: Canon EOS 40D Canon 28-135 F4-5.6 Image info: Shot on tripod, F6.3 1/20s exposure (2) second timer to reduce chance of image blur. Image story: This is the sign for one of my favorite drinking establishments in Wichita. I have often looked up at the neon sign out front featuring a mermaid perched on an anchor and thought I should come shoot it sometime. This shooting challenge gave me a reason to finally venture out for a photo session. While shooting, it was funny that the patrons didn't seem to notice my camera was pointed up at the sign and not at their shenanigans to get my attention. Cheers! Where's the Citgo sign when you need it? This is San Pedro Square Market in San Jose, CA. Canon T2i, 10mm. My absolute favorite bar in the Lower East Side, Max Fish, always has great artwork on display. This neon by George Horner is part of their "End of Days" event, which is the last collection of artwork to be shown there before the bar unfortunately relocates to Williamsburg. Fujifilm X-E1, 35mm at f/1.4, 1/750 sec, ISO 800, unprocessed JPEG. Canon 60D — 38mm — 1/100" — F8 — ISO 100 One of the trickiest parts of this challenge was actually finding an old fashioned Neon sign. Fortunately, my sister suggested the local doughnut shop. Not only did I get a sign picture, I also got doughnuts! This photo was shot with my Sony NEX-5R. ISO 1600, 18mm (Sony 10-18mm lens), f/4.0, 1/100 sec. Th photo has very little processing done in LR4. All I did was center it, lightly sharpen, and apply a bit of noise reduction. Nothing else was adjusted. To get this shot I placed my camera on a fully extended tripod, set it to a 10 second timer, and repeatedly held the camera over my head so that it was level with the sign, which was approximately 12 ft from the ground. I had to take numerous shots since there were a couple factors at work. First, it wasn't easy holding the tripod steady over my head. A lot of the shots had motion blur. Second, the sign was blinking on and off so out of the few shots that came out reasonably sharp, half didn't have the eye lit up or were crocked, off center, etc. This is the sign for a restaurant in Seattle called Cyclops. Pretty cool. Generally, after seeing a few dozen photographers tackle the same topic, I'm full. But this has only left me wanting to see more of these old (and new!) neon signs, which is a testament to the breadth of your submissions. Thanks for participating. Find the big shots on flickr.